Our family friendly holiday park is situated a short drive from central Rotorua in a quiet location with no sulphur odour. We are within walking distance to Lake Rotorua, local trout fishing streams, Ngongotaha village and handy to local showground and golf course. 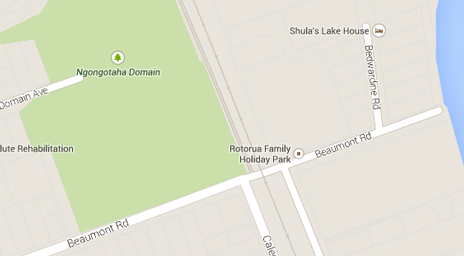 Many major Rotorua tourist attractions are nearby. We offer a range of budget accommodation in Rotorua including powered campervan and tent campsites in our Rotorua campground. Rotorua Family Holiday park also have standard cabins, self-contained 1 and 2 bedroom units, ensuite room, queen suite and motel units in central Rotorua. Perfect for family or group accommodation. Amuse the children at our playground with netted trampoline, TV/games room and from Nov-May our solar heated swimming pool or hire our spa pool. Our central Rotorua family accommodation has options to suit all budgets. For the keen trout fishermen/women our camp is only a short walk or drive to some of the best fishing spots in the area. We have an on site Fishing Tackle Shop and sell Fishing Licenses. We are pet friendly accommodation. Pets are welcome upon arrangement. Information is available for all local attractions and we are happy to help with bookings and recommendations. Contact us for more information or book online today.